Posting Your Timeshare Listing to FSBO No matter where your resort your timeshare is, you can list it on our site. The posting has a minimal fee that gives you a membership with FSBO for an entire year plus an additional month just because you signed up. In other words, FSBO gives you 13 months with plenty of opportunity to show off your timeshare resales properties. Membership/fee payments are done through PayPal for your online protection. Once you have registered, you can indicate which resort your timeshare is at. Then, you can add a description of your timeshare property. The more details you include in the description, the more you help potential buyers learn about the timeshare you are selling. This makes it easy for buyers to browse through our listings and learn more about your timeshare properties. Including Photos Photos can be really important to buyers because they give them an idea about the property they are considering. Therefore, when you post your timeshare property to FBSO, you have the option to include photos of your own unique suite, condo, studio, lodge, etc. . . . This allows buyers to make that final decision and figure out if your property is worth the investment and the money they are going to spent. Making the Final Sale Once you have listed your timeshare resales properties and possibly included photos, all you have to do is sit back and wait for a buyer to click on your timeshare and interact with you directly. From that point on, you (the seller) deal one on one with the buyer, negotiating at your own terms. FSBO does not interfere with the sale. This means that the final sale goes all to you. FSBO does not earn any commissions on the sale the way a timeshare broker would. What you earn is all yours. FSBO merely connects the buyer and seller together. FSBO is a wonderful way for timeshare resales owners to sell their property on their own terms and take the final sale home without paying a timeshare broker. TV in each bedroom: If you just want to stay in bed and watch your favorite shows, you can do so here. Or, you can watch from the living room. It’s all up to you. Living Room: The living room is spacious and has its own balcony with a view of a gorgeous lake. Fully-equipped kitchen: Each villa has a kitchen supplied with a refrigerator, microwave, oven, coffee maker, and more. You’ll even find all the dinnerware and cookware you need. Oversize soaking tub: With each bedroom comes an oversize soaking tub, so you can unwind after a nice day at the beach. Balcony with table and chairs: In each villa you’ll find a balcony with a lovely view. In addition, the balcony comes with a table and chairs, which gives you the ability to eat breakfast all the while enjoying nature. Fitness center: If you love starting out your day with a nice exercise, then this resort is perfect for you. With the top-of-the-line equipment, your work out needs will be met. 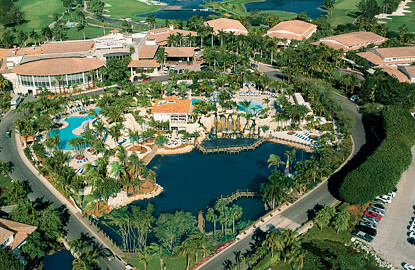 Championship golf: You can enjoy a nice golf game at any one of the five golf courses at the Doral Golf Resort and Spa. Swimming pool and whirlpool spa: Being in Miami calls for outdoor fun under the sun. With the outdoor swimming pool, whirlpool spa, and the Blue Lagoon water recreation zone, this is all made possible. Spa: You can even enjoy a relaxing massage at the Spa at Doral. Dining: Need a break from cooking but don’t want to go too far? You can dine at one of the restaurants and bars at the Doral Golf Resort and Spa. There are many activities and attractions near Marriott’s Villas at Doral that make this an ideal timeshare resale resort. 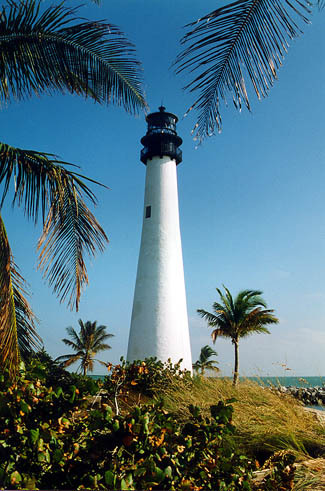 For instance, you can drive to South Beach, which is approximately 15 miles away, or visit Vizcaya Museum and Gardens, which is approximately 13 miles away. While you’re at South Beach, you can also enjoy the restaurants and cafes as well as all the shopping boutiques on Ocean Drive. Furthermore, Art Deco District is close to South Beach, so you can have an exciting day in the area. With everything not too far off, you can have a great time at the resort followed by an entertaining day and night out in the city. Marriott’s Villas at Doral is the perfect timeshare resale resort to stay at while visiting Miami. With all the excellent features within the resort, like the golf courses, swimming pool, spa, and fully-furnished villas, you’ll feel as if you’re home away from home. Moreover, with the city life close-by, you’ll have even more fun and feel that you are truly on the vacation of a lifetime. Check out the timeshare resales by owner properties and see for yourself! Villas and Accommodations At the Welk Resort in San Diego, there are two types of villas to choose from: Villas on the Greens and Mountain Villas. The former villas are basically vacation homes with a garden view, while the latter villas are vacation homes with a mountain view. Both are lovely and come with different accommodations. Two Bedroom Lock-Off: Each villa has a two-bedroom lock-off, which means that you get two vacation homes in one, so you can use both sides or lock one of them up. You’ll also have two master bedrooms with a king size bed and a wall-mounted TV. Queen Sleeper Sofa: This is great if you’re vacationing with a big family. You can open up the queen sleeper sofas and add two extra beds to your villa. Fully-Equipped Kitchen: This is the definition of home away from home. Having a fully-equipped kitchen means that you can store food in the refrigerator, cook on the stone or in the oven or microwave, and then clean all the available kitchen dishes, cookware, and utensils in the dishwasher. Dining Area: These villas do indeed have their own dining area. Washer and Dryer: Why return home with dirty laundry when you can get everything washed right in your vacation home? Private Balcony/Patio: The private balcony or patio that come with each of these villas let you truly enjoy the garden view. One, Two, or Three Bedrooms: The Mountain Villas at the Welk Resort in San Diego are just as spacious, if not more, than the Villas on the Greens. For instance, the one bedroom villas are as equipped as the two or three bedroom villas. Though, what makes the one bedroom villas special is that they are simply part of a two-bedroom lock-off. This means that you can buy or rent timeshare with only one bedroom at the Welk Resort or add another villa and have twice the space. On the other hand, the two bedroom villas have a king size bed in both the master bedroom and the guest bedroom. As for the three bedroom villas, there’s a double French door entry to the master bedroom. Plus, the first guest bedroom comes with a king size bed, and the second guest bedroom comes with two queen size beds. Window Seat: Some of the Mountain Villas have a window seat, allowing you to enjoy a great view all the while relaxing, reading, or doing whatever it is you like to do in your spare time. Fireplace: Mountain Villas at the Welk Resort come with a fireplace in the living room and/or the master bedroom. Queen Sleeper Sofa: Just as with the Villas on the Green, the queen sleeper sofa in the Mountain Villas add more beds to your vacation home. Fully-Equipped Kitchen: All of these villas have fully-equipped kitchens as well as a washer and dryer for your laundry. Complimentary Wi-Fi: The Mountain Villas offer this wonderful feature, so that you can upload your vacation photos online, chat with friends, or even check up on work. Activities When you buy a timeshare at the Welk Resort in San Diego, you get many activities to choose from, such as golf, tennis, family movie night, and a live show at the Welk Theatre. There are also eight swimming pools with waterslides, with one of the pools being strictly an adults-only pool. Nearby Attractions There are tons of attractions near the resort. For instance, San Diego Zoo Safari Park, LEGOLAND, and Carlsbad Beach are within 35 minutes driving distance. SeaWorld, the San Diego Zoo, and Del Mar Fairgrounds and Racetrack are within 45 minutes driving distance. Plus, you can reach Disneyland, Palm Springs, Hollywood, and even Mexico within an hour and a half to two hours by car. Though these latter excursions are a bit far, they are worth visiting when you are in San Diego. It’s a wise idea to buy a timeshare at the Welk Resort in San Diego, since everything you may need or want is at your fingertips. Furthermore, with the nice weather all year long, you can be sure that you’ll have a fun vacation indoors and outdoors. Posting Your Timeshare Listing to FSBO Whether your timeshare is at a Disney, Wyndham, Marriott, Ritz-Carlton, Hilton, or any other resort, you can post it on the FSBO site for potential buyers to look at. The posting has a minimal fee which you can pay through PayPal. Once you have registered, you can indicate which resort your timeshare is at. Then, you can add a description of your timeshare property. For example, do you own a one-bedroom suite, a two-bedroom suite, a spacious studio, or perhaps a timeshare lodge? Is there a fully-equipped kitchen with a big fridge, an oven, and a microwave? You can even comment on whether or not the property comes with a balcony or a patio or even a free wireless internet connection; after all, lots of people enjoy these extra features. The more details you include in the description, the more you help potential buyers learn about the timeshare you are selling. So be sure to describe the bathrooms, the living room, and any other important information. This makes it easier for you to sell a timeshare. Additionally, you might want to include a bit of information about the resort itself. 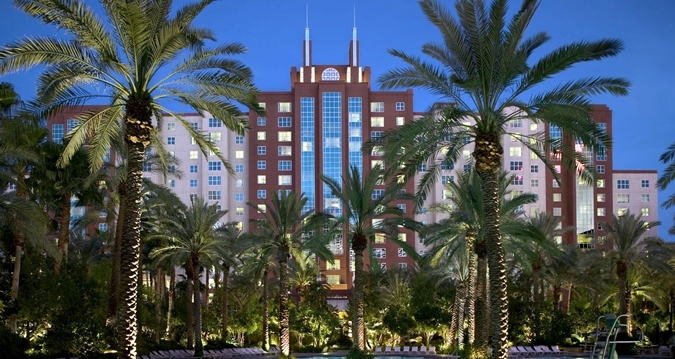 For example, if you’re selling a Disney timeshare in Orlando, Florida, you can talk about the amenities and features that particular resort has, such as how many indoor and outdoor pools there are, whether the resort has a spa, a children’s program, a daycare center, a movie night, and maybe even restaurants where you can dine with Disney characters. You can also mention if the resort has a championship golf or tennis and basketball courts. These are great details to include! Including Photos Photos can be really helpful to buyers. People love seeing what they are going to buy before they purchase it. It is the best way for them to get a good idea and make a smart, final decision on the purchase. So, once you’ve posted your timeshare property at FBSO, you have the option to include photos of your own unique suite, condo, studio, lodge, etc.… This makes a big difference with buyers. Making the Final Sale After you’ve posted your timeshare property and possibly included photos, all you have to do is sit back and wait for a buyer to click on your timeshare property and interact with you. From that point on, you (the seller) deal directly with the buyer. FSBO does not interfere with the sale. This means that the final sale goes all to you. FSBO does not earn any commissions on the sale the way a timeshare broker would. What you earn is all yours. As you can see, FSBO connects you, the seller, to your potential buyer, and this is an easy way for you to sell a timeshare without paying a broker any commissions. Studios: You can choose from studios with one, two, or three bedroom suites. The suites come with a fully-equipped kitchen, a washer and dryer, and complimentary Wi-Fi. Swimming pools: The Boulevard has two heated swimming pools and three whirlpool spas. So even though the suites don’t come with a master bathroom and a whirlpool jet tub, you can still have a place to unwind. Fitness center: They really, really love their fitness centers, and we’re not complaining! Spa: After a long day out in the city, you can always return to the Boulevard for a nice time at the spa. Studios: Trump International Hotel has studios with one or two bedroom suites. The studios come with fully-equipped kitchens. Swimming pools/hot tubs: This resort has an outdoor swimming pool and hot tub as well as a heated pool on the sixth floor deck. So you could unwind while you admire the Las Vegas scenery. Fitness center: You can kick start your day by being active at this resort’s fitness center. Spa and salon: At the Trump International Hotel, you can go all out by getting a nice massage and perhaps even getting your hair styled and your nails manicured. Private Chef: If you want to pamper yourself and your significant other, you can request a private chef. He/she will cook for you during your vacation and even bring food directly to your room. Studios: Although you can only choose from one or two bedroom suites, the studios are expansive. Unlike the other resorts mentioned here, all suites at the Paradise come with a fully-equipped kitchen. Additionally, all suites come with a master bathroom with a whirlpool jet tub, a washer and dryer, and complimentary Wi-Fi. Swimming pool: The Paradise has a heated swimming pool that comes with a whirlpool spa, so you can have a relaxing time whether you’re in your room or at the pool. 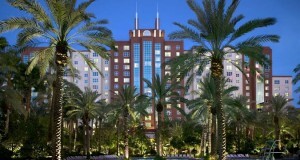 Fitness center: As always, Hilton Grand Vacations Club Resorts just love their fitness centers. Studios: You can find timeshares for sale here with spacious studios that come with one, two, three, or four bedroom suites. Additionally, there’s a kitchenette in the studios with the one bedroom suites and a fully-equipped kitchen in the studios with the two, three, and four bedroom suites. Pool/spa tub: The Elara Resort has many relaxing features, such as the outdoor swimming pool and the many hot tubs. Fitness center: Just like the many Hilton Grand Vacations Club Resorts, this one has a fitness center. So even if you’re away from your home gym, you can get active whenever you want. Bar and lounge: Want a drink but not yet ready to go out? You can go to Elara’s bar and lounge. Starbucks: This is great for coffee lovers. Yes, this resort has Starbucks right in its lobby, and it is open 24/7 too! Hilton Grand Vacations Club has the best timeshares for sale in the Las Vegas Strip, and now, you can buy a timeshare directly from an owner. Timeshares can be costly, but they don’t always have to be. In this blog, we are going to make a distinction between regular, pricy timeshares and timeshare resale, which is affordable and more worthwhile. Plus, resale timeshares beat hotel vacations. How timeshare works Let’s start out by describing what timeshares really are. Unlike regular vacations where you have to constantly plan your stay, timeshare allows you to always have a vacation destination to go to. You make a one-time purchase of the vacation resort of your choice, and you would basically have a home away from home for approximately one week each year. You would still have to pay an annual fee, but it is affordable, and it’ll go toward maintaining the resort of your timeshare. In other words, you’d be paying to keep your timeshare property and resort clean and running. Nevertheless, having a timeshare in a certain vacation resort and destination doesn’t mean that you’ll have to go to this exact place year after year for the same week. Timeshare is very flexible; you can always exchange your timeshare with another and travel to destinations you have yet to see. Additionally, you can change the time of your vacation. This allows you to move your vacation from, say, the first week of July to the last week of the year. You can vacation in Honolulu where you have a timeshare or go to a different resort in Italy, France, Greece, Thailand, and so much more. With thousands of resorts to choose from both in the U.S. and worldwide, you’ll always have a vacation and never be struck with boredom. Though, you can have all this with resale timeshare, which is cheaper still. What is resale timeshare? Now that the concept of timeshare is clear, let’s discuss resale timeshare. Timeshare resale is the sale of a timeshare which used to be owned. How it works is that a previous timeshare owner decides he wants to sell his timeshare, and so it becomes listed for sale again. This is where you probably start wondering why anyone would purchase a previously owned timeshare. Well, when you buy resale timeshare, you’re not buying an old, rundown property. Instead, you are buying a nicely furnished, well-maintained resort property. Not only that, but you’d be buying it at a discounted price, since resale timeshare is always cheaper than regular timeshare. Hold up! Why should I buy a timeshare an owner no longer wants? You have to remember that those selling their timeshares are people who purchased the vacation home at full price, and when you purchase a timeshare straight from the developer, 50% of what you pay goes to the developer’s marketing costs. Think about that for a moment. This means that vacation homes sold at “full” price aren’t even worth 50% of what buyers are paying for them. Now, think about those owners who are selling their timeshares. They had to pay the full price the developers claimed the vacation home was worth. Then, once the timeshare was theirs, they had to pay annual maintenance fees. This is why they are not happy with their timeshares and no longer want them. They’ve spent a lot of money, enough to probably put them in debt, and they still pay. Thus, they find themselves with no other choice than to sell the vacation home in order to earn back a small portion of what they paid. Of course, this isn’t always the case, but it often is. Sometimes, timeshare owners want to sell their property simply to purchase one in a different destination. How to buy resale timeshare If you want to buy timeshare resale, you can connect directly with an owner here on Timeshare FSBO. You don’t have to pay any fees, which means that you can browse through the list of resorts and timeshare properties and email owners. You don’t pay FSBO anything, not even for the final purchase. Timeshare resale is the smartest way to purchase a timeshare without throwing all your money away, and with FSBO, you can connect directly with timeshare owners. This year, why not spend a week at Las Vegas? With timeshare resales by owner you can find the best timeshare property at Hilton’s The Flamingo Resort to stay at each year for a week. The popular city of Las Vegas is always a busy place, but that’s what makes it so great. So if you’re looking to be immersed in one activity or another, keep reading to find out more about this great resort that you can get with timeshare resales by owner. Accommodations Since The Flamingo Resort is part of Hilton’s Grand Vacations Club, its accommodations are somewhat similar to the rest of the club’s resorts. For instance, this resort’s studios are spacious, and you can choose from one and two bedroom suites. At the same time, each studio comes with a master bathroom that includes a whirlpool jet tub; this is perfect for unwinding after a long day out in the city. Within the suites, you’ll also find a fully-equipped kitchen as well as a washer and dryer. This allows you to cook or heat up food in your timeshare property, make coffee in the morning like you do back home, and even keep your clothes clean so you don’t have to take your dirty laundry with you when the vacation is over. To top this list off, each suite gets complimentary Wi-Fi. 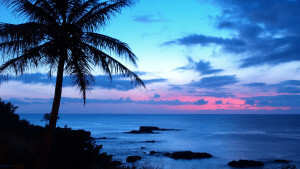 With these outstanding accommodations, buying timeshare resales by owner is a wonderful idea. Heated swimming pool: If you’re vacationing during the cold season, or if you’re just a person who hates cold water, then this heated swimming pool is fit for you. You’ll be able to enjoy the pool without the cold temperature getting in the way. Whirlpool spa and sauna: Just like the whirlpool you’ll find in your suite’s master bathroom, the whirlpool spa and sauna features are ideal for relaxation at the end of a fast-paced day in Las Vegas. Fitness Center: Just because you’re on vacation doesn’t mean that you don’t want the option to exercise. The Flamingo Resort understands this well, which is why they have a fitness center that you can use any time you want. Thus, if you want to remain in shape before your big wedding day or just tone your body for the fun of it, you can. Lounge: The lounge is certainly not the last amenity this resort offers; however, it is a great amenity. It is a pleasant place to sit and take a break at or even to gather your group of friends at before you head off somewhere together. Another reason The Flamingo Resort is wonderful is that it is in close proximity to many of the Las Vegas Strip attractions. 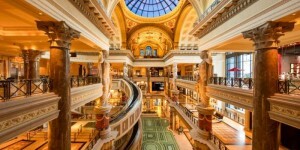 In fact, you can reach many renowned Las Vegas attractions on foot. That’s how close the resort is to everything. For example, Caesars Palace is only 0.9 miles away, Planet Hollywood Resort and Casino is 0.8 miles away, and Paris Las Vegas (where the Eiffel Tower restaurant is) is 0.7 miles away. Additionally, if you and your friends are into golf, you can even head over to The Wynn Golf Club, which is 1.8 miles away. Overall, timeshare resales by owner at Hilton’s The Flamingo Resort is a fantastic way for you to have a great vacation in Las Vegas year after year. If you’ve never owned a timeshare, then you probably have questions on what makes timeshares worth your time and money. Surely paying $200 for a few nights’ stay at a hotel is much cheaper than paying thousands of dollars for a timeshare. And yet, how come many people are preferring timeshare over hotel stays? It all comes down to the fact that timeshare gives you more accommodations and amenities. Plus, if you buy timeshare resale, you don’t have to spend as much as you’ve been told. Buying timeshare resale can sometimes be 50% cheaper than regular timeshares. Timeshare Prices vs. Hotel Prices Sure, when you buy timeshare, you pay more than you would if you were to stay at a hotel room for a few nights. However, in the long run, you actually save more money with timeshare than you would with hotel rooms. This is because you’re making one payment (say around $2,000) to have a vacation home for one week each year for the rest of your life. Of course, you would still have to pay annual fees to your timeshare resort, but those small fees go toward maintaining your vacation home and all the features (like the swimming pools and fitness centers) that you would use during your stay. Plus, if you invest in timeshare resale, the price that you pay for your vacation home is even less than expected. On the other hand, when you stay at a hotel, you don’t pay a lot of money compared with a timeshare vacation. Though, if you go on a hotel vacation year after year, the total amount spent would be much higher than if you were to buy a timeshare. Timeshare Accommodations vs. Hotel Accommodations Many hotels have a couple of neat room accommodations, like an in-room fridge and TV. 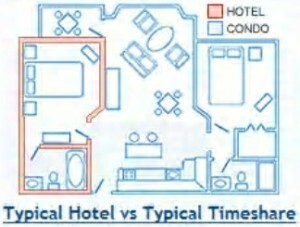 Yet, these accommodations in no way compare to the wonderful accommodations that timeshares have. What makes timeshares stand out is that they almost always come with fully-equipped kitchens, dining rooms, living rooms, master bedrooms, master bathrooms, and possibly even washers and dryers. You even get complimentary Wi-Fi at most timeshare resorts. With regular hotels, accommodations are certainly nice, but they’re not as abundant and satisfying as they are with timeshares. Timeshare Resort Features vs. Hotel Features When you pay once for a lifetime of timeshare vacation stays, you also get amazing resort features, such as multiple swimming pools, a fitness center with top-of-the-line equipment, an arcade room for your kids, resort dining, and so many other features. Alternatively, hotels don’t always come with features, and if they do, they’re not always as plentiful. If you’re lucky enough, you’d be able to book a hotel with a swimming pool or a deli shop, but that’s usually about it. Timeshare Locations vs. Hotel Locations Additionally, buying a timeshare lets you to choose the perfect destination and location for you. So, if you’re into staying in Orlando, FL, and visiting the many exciting theme parks, you can have a vacation property right in the area that you can come back to each year. Also, if you ever need a change of scenery, exchanging your timeshare for another in a completely different destination is super easy. You can go to Hawaii, New York, or just about anywhere you want. Not to mention that timeshare resale gets you your preferred destination vacation for less! In comparison, you can definitely book a hotel room in your desired destination and location. Though, you wouldn’t be able to come back every year to the exact same place without paying again. You would end up throwing your money around year after year when you could own your own vacation property. So what do you think? Is timeshare resale for you? Do you currently own a timeshare and feel tied down to it? 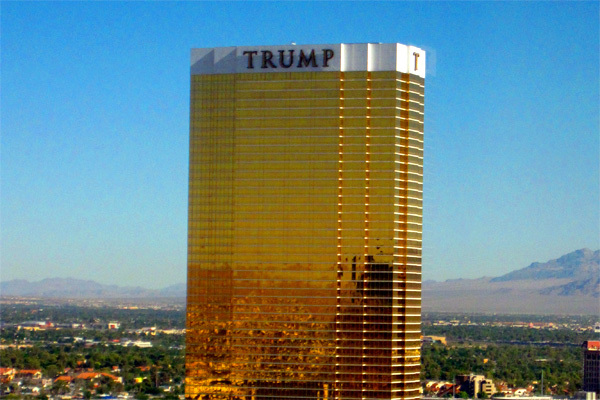 Perhaps you just want to buy a new timeshare elsewhere and enjoy a different scenery. Or perhaps you would like to save some money. No matter the case, you don’t have to keep the timeshare and continue spending money on maintenance fees. In fact, you can sell a timeshare here at For Sale by Owner (FSBO) without paying any broker or realtor fees. To learn more about how FSBO works, continue reading! Posting Your Timeshare Whether your timeshare is at a Hilton, Marriott, Wyndham, Ritz-Carlton, Disney, or any other resort, you can post it online for potential buyers to look at. The posting has a minimal fee which you can pay through PayPal. Once you have registered, you simply specify which resort your timeshare is at. Then, you can add a description of your timeshare property. For instance, do you own a one-bedroom suite, a two-bedroom suite, or a spacious studio? Does the property come with a fully-equipped kitchen? You can even mention if the property comes with a balcony or patio, free wireless internet connection. The more details you include in the description, the more you help potential buyers learn about the timeshare you are selling. So be sure to describe the bathrooms, the living room, and any other important information. This makes it easier for you to sell a timeshare. Additionally, you might want to include a bit of information about the resort itself. For example, if you’re selling a Marriott timeshare in San Diego, California, you can talk about the amenities and features that particular resort has, such as how many indoor and outdoor pools there are, whether the resort has a spa, a children’s program, a movie night, and any restaurants. Maybe the resort has a championship golf or tennis and basketball courts. These are great details to include! Including Photos Photos can be really vital when selling almost anything. After all, people love seeing what they are going to buy before they purchase it. It is the best way for them to get a good idea and make a smart, final decision on the purchase. So, once you’ve posted your timeshare property at FBSO, you have the option to include photos of your own unique suite, condo, studio, etc. . . . This truly makes a difference with buyers. Wait and then Make a Final Sale Once you’ve posted your timeshare property and possibly included photos, you just sit back and wait for a buyer to click on your timeshare property and interact with you. From that point on, you (the seller) deal directly with the buyer. FSBO does not interfere with the sale. This means that the final sale goes all to you. FSBO does not earn any commissions on the sale. There you have it! Selling with FSBO is as easy as selling a textbook on Amazon. So, if you’re looking to sell a timeshare, For Sale By Owner (FSBO) makes the procedure of reaching a buyer straightforward and stress-free.